Special Containment Procedures: SCP-1032 is to be stored in a high-value inanimate-item cell at Sector-19. One unarmed guard is to be posted inside the cell at all times to prevent tampering. SCP-1032 is to be monitored at all times by a high-speed camera fitted with a macro lens capable of no less than 20x magnification, or greater as necessary to ensure that all text on the hands is legible. The footage from this camera is to be searched daily for any instances of any hand passing the 12 o'clock position ("midnight events"; see Description). After each midnight event, the new text for the hand involved must be recorded, and its current speed and estimated time to midnight calculated. Description: SCP-1032 is a silver alarm clock of unknown make and origin. 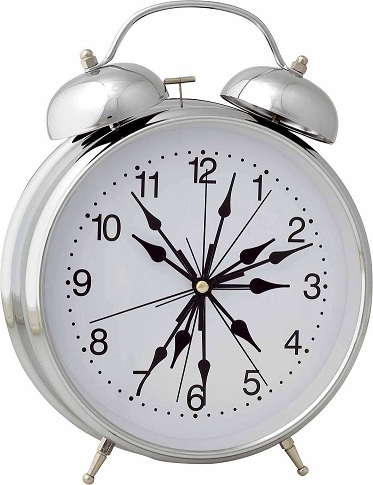 The clock is made from silver, plastic, and glass, and bears twenty-two (22) hands of various sizes and shapes. The movements of SCP-1032's hands do not measure the passage of time. Each hand instead measures the time until the end of an ongoing event or the destruction of an extant entity. White text on the front of each hand, in sizes ranging from barely legible to microscopic, describes the event to be measured by that hand. When one of SCP-1032's hands reaches the twelve o'clock position, several events occur simultaneously, the combination of which is referred to as a "midnight event". First, the event or entity currently written on the hand ends or is destroyed. Second, the text on the hand spontaneously changes to describe a new event or entity, which need not bear any relation to the previous one. Third, the hand's rotational velocity changes. To date, SCP-1032 has never been wrong: every event appearing on its hands has ended precisely at the moment of the corresponding midnight event. It has accurately predicted the deaths of over █████ individual organisms, the fall of ██ governments, the dissolution of ███ major agencies and institutions, the death of a language, and the beginning of the ███████ ███. Since any given hand's speed remains constant at all times except during midnight events, the time to the end of any entity measured by one of the object's hands can be predicted precisely. The hands are designated SCP-1032-01 through -1032-22, in order of size from smallest to largest. Current text: SCP-1032-01 rotates too fast to have a constant measurement. Notes: SCP-1032-01's only recorded text to date has been one of the three following: "A thought." "A sound." or "A sensation." Current text: "The worst thing that will ever happen to anybody." Predicted date: SCP-1032-02 moves too slowly to measure. Notes: Due to the vagueness of this inscription and the impossibility of calculating the time until its next midnight event, no useful information on SCP-1032-2 is available. Current text: "My Safe classification." Notes: Dr. Guenther has suggested that, since SCP-1032 shows signs of self-awareness, it should be promoted to a Euclid-class threat. This proposal is scheduled for review on the 2nd of June, 2012. Current text: "My Euclid classification." Notes: As SCP-1032 has yet to manifest any properties warranting a Keter classification, Dr. Edison has proposed that SCP-1032 should be demoted to Safe. This proposal is scheduled for review on the 9th of January, 2015. Notes: It is unknown whether this refers to the actual end of our universe, to the end of all entities that could be referred to as universes, or merely to the end of the concept of universality. Current text: "A failed infomercial." Notes: SCP-1032-05 moves very quickly, cycling two to five times per day. To date, it has never displayed any other inscription. Current text: "Freedom of the Press." Notes: SCP-1032-06 does not specify the country or countries whose freedom of the press will end. Current text: "The use of the phrase 'You can say that again'." Current text: "Hostilities between the nations of Africa." Notes: As SCP-1032 has often predicted violent or disturbing events using apparently harmless phrases, this inscription is considered equally likely to predict peace in Africa or the destruction of the continent. Current text: "Jason W. Tailor Jr.'s sister's daughter." Notes: To date, all inscriptions on SCP-1032-10 have described individual human beings. These people are usually difficult or impossible to identify and locate. On 12/04/2011, however, SCP-1032-10 predicted the death of D-56342, a Class D subject then assigned to SCP-1032. Five minutes before his predicted death, the subject was sealed in an airtight steel chamber with two guards; all three were equipped with self-contained breathing apparatus. Despite all precautions taken, D-56342 expired exactly at the predicted time. His guards were initially unable to determine the cause of death, until it was discovered that his oxygen tank had mistakenly been filled with the pressurized VX nerve gas used to control SCP-████. Further investigation is in progress. Current text: "President ████████'s term in office." Notes: ███ ████████ is currently the president of █████████████. Current text: "███████ █████ Burger Joint"
Notes: All SCP-1032-012 inscriptions describe non-corporate restaurants. On 06/10/1993, in an attempt to keep "██████'s Hotdogs" from closing as predicted, the SCP Foundation donated an anonymous $10,000 to the restaurant on condition that it remain in business. The owner renovated and renamed it "█████ ███████". Notes: Researchers are attempting to discern whether or not this will constitute SCP-1032's first failure. Current text: "Radio's viability as an art form." Notes: To date, all of SCP-1032-14's inscriptions have referred to mediums of art. Whether the inscription predicts the actual end of radio or merely its usage in art is unclear. Notes: SCP-1032-15 will achieve its "midnight event" at approximately the same date as SCP-094 will fully engulf the Earth at its current rate of expansion. Notes: ████████████ ████████████████ is a popular Mexican soap opera. Current text: "The SCP Foundation." Current text: "Concern for public health." Notes: It is unclear whether this inscription predicts a lack of need for concern or a lack of concern in general.